It’s no secret that I’ve been struggling with a very dry skin for the past few years. Either due to the unfavourable British climate or the effects of the ageing process (I’m so close to 30! ), I’ve been dealing with constant skin dryness for over 4 years. The times when I could rely solely on my Nivea cream, applied once a day, are long gone. Nowadays, my skincare routine includes moisturising serums, creams, masks and oils. Without them, I’ll probably turn into a dry raisin! Well, not immediately, but probably pretty quickly. This month I’ve already introduced you to 3 moisturising products I’ve used for my thirsty skin. Today, I’m going to get this post rolling with another three! Ahead, you’ll find a bit more information and my experience with two hydrating products from Avène and a rice oil mask from Barefaced! As you’ve probably guessed from the name, Avène is a French company, specialising in skincare products. It is named after a small commune in France, where they discovered the healing properties of Avène thermal spring water. Since then, all of the brand’s products have been packed with it! The very first Avène product I tried was a moisturising hand cream. I loved it so much, that I thought I should check out what else the brand has to offer! I soon stumbled upon the Avène Hydrance Optimale UV Light Hydrating Cream. It promises to restore the skin’s moisture while giving a matte-effect look. The Avène hydrating cream is, of course, packed with the thermal spring water I’ve mentioned above. One of the spring water’s benefits is ensuring a long-lasting hydration. This moisturiser also has a SPF20, which I think is a great advantage, as I don’t need to apply other sun protection products! The addition of sebo-absorbing capsules helps the product to leave your skin with a smooth, matte finish. 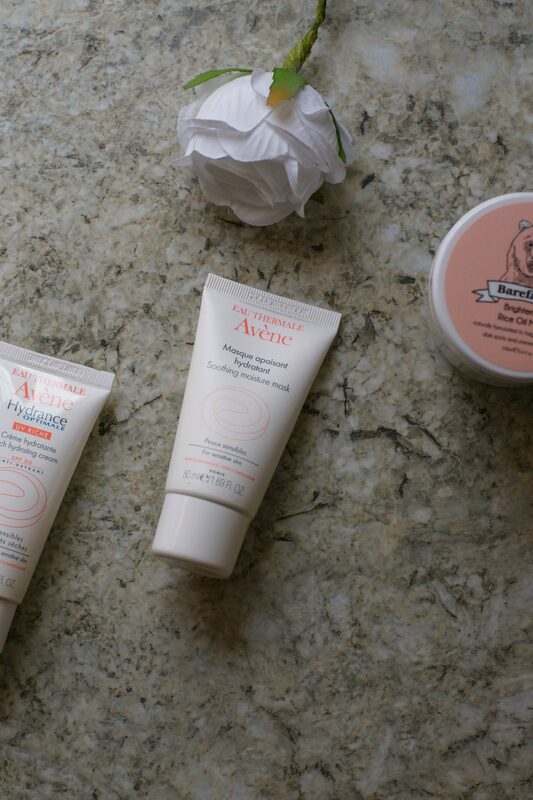 I started using the Avène Rich Hydrating Cream during our visit to Japan last year. Suffice to say, I still have some left! A tiny amount of the product is enough to cover your whole face. I only apply it during the day due to its SPF feature. You might find it odd but the cream has the texture of a sun protection cream. White and thick but at the same time light! It glides on smoothly, leaving my face feeling moisturised and refreshed throughout the whole day. And that SPF20? Oh, it works! I didn’t burn even once in spite of the scorching 39 degree temperatures in Japan. Compared to my poor arms, my face was redness-free! The other Avène product I’m going to review today is the Avène Soothing Moisture Mask. This mask is perfect not only for dry and dehydrated, but also for sensitive skin! If you’ve found yourself suffering from symptoms of redness, tightness and stinging, then this moisturising mask is the right one for you! It will leave your skin with a healthy and radiant appearance. The moisturising mask has a rich, creamy formula, also packed with the Avène Thermal Spring Water. Moreover, it includes Triglycerides to help to restore the hydrolipidic barrier, as a way to nourish dehydrated skin. In this way, the skin absorbs more water and therefore its levels of hydration are increased. I apply the Avène Soothing Moisture Mask in thick layers to my face once or twice a week, whenever I need that extra moisture boost. You can also apply it to your neck, however I personally want to save the product for my main concern! Following the instructions, you should leave the mask for up to 15 minutes. However, as with any hydrating mask, I tend to leave it for 20+ minutes. I then rinse the mask off with lukewarm water and pat dry my face. After washing, I immediately feel my face smoother and hydrated. It is a great moisturising mask with a lovely scent and you need to try it! I strongly recommend using this mask before going to bed as you’ll be able to prolong its effects. Let me start this review by saying that I love Japanese products! I’ve already used and reviewed a couple of Japanese products. Some of them include the DHC Face Wash Powder & DHC Eye Bright, which I couldn’t recommend any higher! Recently, I’ve also had the pleasure to try the Japanese ION-Sei Electric Toothbrush by Sanyei. However, I think this was my first ever Japanese skincare product to try. The Barefaced Brightening Rice Oil Mask is enriched with one of Japan’s anti-ageing secrets – rice bran oil! With all its natural components, rice bran oil is used for both skin lightening and anti-ageing. Moreover, it contains a vitamin B complex, therefore stimulates circulation and cell growth. This rice mask is also rich in vitamin E for repairing scars and restoring damaged skin. Additionally, the Barefaced mask is packed with kaolin, shea butter and essential oils galore. Kaolin clay draws out toxins and impurities, while shea butter helps protect the skin’s natural oils and reduces inflammation. Being 100ml, the Barefaced Brightening Rice Oil Mask will last you forever! Well, not forever but quite possibly a year if you use it once a week. Initially, I applied a thick layer of the mask and waited for 15 minutes before rinsing. However, I find the texture to be quite thick and didn’t like how it felt. Therefore, I started applying a thin layer instead, which worked quite well. It still feels quite thick on the face but not in an unpleasant way. Sadly, what I did find unpleasant was the smell. Eventually, I got used to it but the mixture of all of these oils delivers a very strong scent. Putting the smell aside, this rice oil mask delivers! I had a few dark spots from sun damage (this was before using any SPF products, silly me!) and they had completely disappeared after a month or so! I can’t say if this mask helps with anti-ageing but it does hydrate your skin. However, if you’re looking for a natural way to remove dark spots, then this mask is for you! Check out skincare for more product reviews! Thanks for stopping by Nina! I love asian cosmetics too, its packaging is very cute! I did not try any of the products, but I would love to. They really are! Also very affordable!